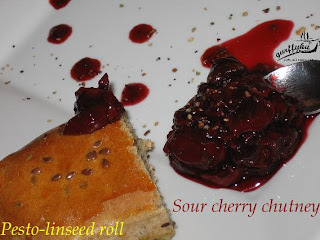 If you like to taste sweet and sourish, picant and spicy in one bite, you have to try this sour cherry chutney! Peel the onions, chop in half, than in slim slices. Put in a bigger pot, add the red wine and steam-boil is for 15-20 minutes, till the onion absorbs the wine and makes gravy. Add the balsamic vinegar, stir few times, than add the sugar and continuously stir with the onion for 6-8 minutes. Add the sour cherry (after washed and pitted) and mix it well with the onion covered softly with burnt sugar. Possibly, after adding the sour cherry, to stir use a beater, so some of the sour cherry will get mixed but major part remains as full fruit. Leave it to boil. In the meantime put all spice - except the nutmeg - in a kitchen mixer and chop it well, then add to the chutney. Grave the nutmeg - I used approx one third of a full nutmeg - and also add to it. Stiring few times leave it to boil for 20-30 minutes, so the sour cherry juice boils out. Add the canning sugar, mix well, boil the chutney for 5-6 minutes on big fire. 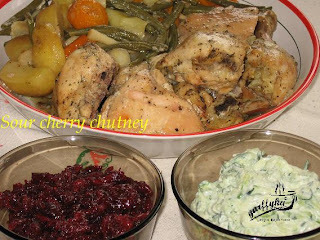 Take some from the chutney on a clean plate to taste and test the consistence. Spice or sugar might be added, if needed. After adding any new ingredient, boil the chutney for 5-6 more minutes. When declared ready, take the prepared, clean and dry bottles and spoon by spoon fill it with the delicious sour cherry chutney. Cover the bottle with a sheet of canning foil then place the cup and pinch it as hard, as possible. Turn the filled bottle on top, place it on a tray and leave in this position for at least 6 minutes. 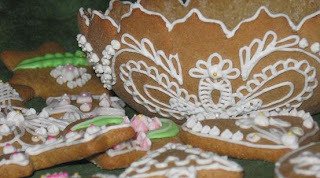 After this the canned chutney might be hoveled. The fresh made sour cherry chutney might be served as ready. Accompanies well chicken or sea fish for lunch or dinner, but it's also gorgeous as appetizer with a slice of brown bread, home made pesto-linseed roll or fresh green salad.